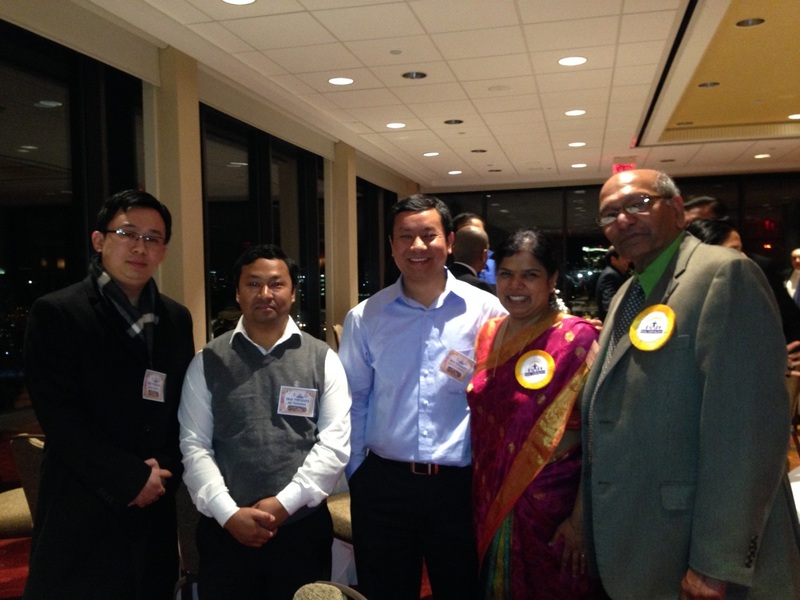 BOSTON (February-24-2014) : Knowledge Exchange Network(KEN) Manipur members from USA (Lakshmikant Laikangbam, Ajit Thokchom, Kelvin Ashem) attended Ekal’s annual Fund Raising event at “Hyatt Regency, Boston, MA USA” on February 22, 2014. During the event, KEN members interacted with several high profile Ekal Vidyalaya (EV) members including Vinod Jhunjhunwala ( President), Ranjani Saigal (Executive Director).They discussed how KEN and EKAL can work together to spread awareness of the noble work done by EV for the people of Manipur in promoting basic primary education in developing and underdeveloped remote areas of the state. EV operates more than 400 schools reaching 12000 children in Manipur. EV has requested KEN volunteers in and around the world to help EV succeed in its mission and endeavors in Manipur. On behalf of KEN Lakshmikant Laikangbam from the USA had worked in raising funds for EV enough to run 10 schools (around 300 students) for an entire year. Further as part of the ongoing engagement, based on request from KEN and EV, Shri Premchandra Okram, a retired teacher from Thoubal had visited few EV schools in Thoubal district and reported factual information about the ground situation to EV’s management along with pictures of schools, teachers and students. This initiative was highly appreciated in the Fund Raising event at Boston and EV has requested Shri Premchandra Okram, as a part of EV and KEN collaboration effort, to continue visiting EV schools in other districts of Manipur and provide the feedback to ensure the actual benefits of the program reach to those intended for. KEN is a non-political and non-profit association of people of Manipuri origin and their friends living in different parts of the world with varied professional backgrounds, experiences, skills and expertise. With the world has become a global village and has witnessed an IT boom during the last two decades, many people of Manipur origin are now found working in every nook and corner of the world; they are the main constituents of KEN. The mission for KEN is to share and direct these global knowledge, skills, incomes and expertise to Manipur for her all round development and progress which will help to build a strong brand image of the state enhancing confidence among the public and investors which at the moment is in a challenging state in Manipur.